15 September 2008 was the day that Lehman Brothers went bust. Lehman had long been one of the pillars of the US financial system, and management had been hoping for some sort of bail-out, but the US government wasn’t going to play. The Lehman insolvency sent the GFC into full panic mode. The GFC had been gathering pace since June 2007, when the US market for residential mortgage securities began to seize up as buyers became more and more suspicious of the value of these securities at a time when US house prices were falling. Various funds which held residential mortgage securities suspended redemptions because they could not sell their holdings to provide liquidity. 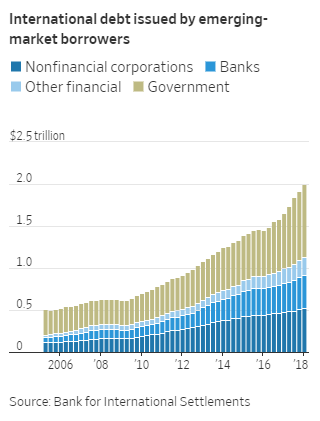 Then the GFC accelerated into 2008 as banks and brokers stopped lending to each other, because none of them knew how many toxic debt securities the other party held – if they held a lot, they might already be insolvent. The insolvency of Bear Stearns demonstrated that this was a genuine risk, and debt markets became even more scared. Equity markets, by contrast, had blithely ignored the onset of the GFC, setting new records in October 2007, but after that they fell relentlessly day after day. After the Lehman insolvency, the global financial system would have ground to a halt if the US government had not stepped in to visibly shore up the major US banks. The US Federal Reserve, fearing a repeat of the Great Depression of the 1930s, cut official interest rates to zero. When this measure failed to cause much improvement, the Federal Reserve adopted the unprecedented policy of buying US government bonds in the hope of re-animating the US economy. These two policies made borrowing much cheaper and led to a rapid expansion of the US money supply. At the time, many economists issued dire warnings that these policies would lead to hyperinflation. As it turned out, consumer price inflation remains very low in the major Western economies. Where inflation has occurred is in financial markets. The US equity market has risen by 350% from its March 2009 low, and many other share markets have not been far behind. But the real growth has been in debt, as the chart below shows. Not surprisingly, eager borrowers took advantage of the new low interest rates. US companies issued bonds with record low coupons, often to fund share buybacks. In emerging economies, governments joined the debt party as enthusiastically as corporations. Countries and companies with bad credit ratings discovered that bond fund managers now wanted their debt because it offered yields which the fund managers could not find in their home markets. The government debt of Ecuador, for example, was welcomed even though the country had defaulted eleven times between 1826 and 2008. (Bond fund managers know that this debt will default, so they try to unload it before it does.) As the chart above shows, debt issuance in emerging markets tripled between 2008 and 2018. The US Federal Reserve has raised its Federal Funds rate from zero to 1.75%, and expects it to reach 3.1% by end-2019. The US Federal Reserve has lightened its balance sheet by USD150bn in bonds since September 2017. The US Federal Government’s deficit nearly doubled from 2017 to 2018, and will rise again in 2019. Financing the deficit means issuing more bonds. The chart below illustrates how global liquidity is turning negative. Out of the world’s four biggest central banks, the Fed is selling off bonds, the Bank of England has stopped buying bonds, and the European Central Bank is buying fewer and fewer, leaving only the Bank of Japan as a buyer. As the chart shows, net liquidity began to shrink this year, and it gets more and more negative in 2019. The trends we describe above have been under way for several years: why do we think that a crisis is going to occur in the near future? 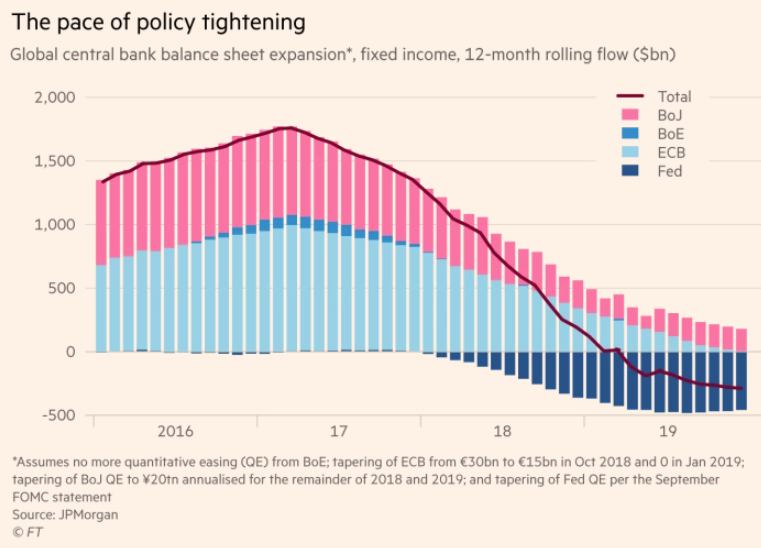 It’s not just the fact that net liquidity creation by central banks has turned negative this year, as the black line in the chart indicates. The imminence of ructions in the global financial system is also signalled by this year’s weakness in the share prices of global banks. The share prices of the global banking sector started to fall in February this year. At first, the share price falls seemed to be caused by stock-specific issues, such as the China liquidity squeeze, the populists coming to power in Italy, Turkey’s unorthodox monetary policy, etc. Then the big US banks started to slide, even though they had very little exposure to the problem economies. In fact, they were major beneficiaries of the Trump tax cuts and the booming US economy, so their share prices should have kept going up. But banks now days gear up their equity capital at least nine times (‘x’), so their profits are sensitive to even the smallest disturbances in the financial system. For an illustrative example of how these sensitivities played out in the GFC, see the graph below showing the survivors. Lehman was not in fact the largest offender (in terms of leverage) as it was “only” leveraged 31x compared to Bear Stearns 33x (gone), Merrill Lynch 32x (had to merge with Bank of America in 2008) and Morgan Stanley 33x (still around). Source: FT, Company press releases and SEC filings, Thomson Reuters, Bloomberg. More to the point, many professional investors know a lot about banks. They work for banks, or they used to work for banks, they still have friends there, they read the banks’ financial statements, and they know the banks’ trading positions (because their own positions are often the other side of the banks’ positions). If a bank has problems, the news will spread very quickly among professional investors. The global slide in banks stocks is telling investors that the global banking system is in for a rough ride. The Arminius quantitative models have been giving us this sort of message for some months, therefore the Arminius portfolios are ready for a shock. If your own assets are not defensively positioned, now would be a good time to panic.